Mr. Shanahan is a lawyer admitted to practice law before all federal and state courts in New York State and the District of Columbia. He maintains an active statewide practice with emphasis on commercial and civil litigation. Shanahan has published various articles in the Albany Law Review and the International Practitioner’s Notebook. He has lectured extensively to legal and professional groups, speaking speaking on a number of topics concerning the civil justice system. 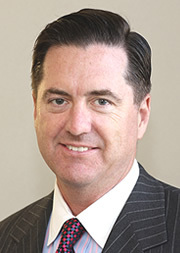 Shanahan has served as an arbitrator for various legal disputes. His research interests include the role of legal regulation in reducing systemic risk to the financial system. He has taught at Simon continuously since 1984. His excellence in teaching includes election by his students to the Simon Teaching Honor Roll. Shanahan is a three-time recipient of the President’s Distinguished Service Award by the New York State Trial Lawyers Association. He is a founding member of the New York Trial Lawyers Academy and a member of the American Board of Trial Advocates. He has served as both an officer and director of the New York State Trial Lawyers Association. Shanahan’s community service has included serving as a trustee of the Manlius Pebble Hill School and as a guest commentator for the Rochester Democrat & Chronicle, the Rochester Business Journal, and the Rochester Daily Record.